Its time to check out the new Leapband, from Leapfrog. As adults, we have our Fitbits and Fuelbands, but wasn’t it just a matter of time before our kids wanted to jump on the wearable tech bandwagon? The brandy-new LeapBand activity tracker is a wristband made for kids that encourages active play and healthy habits (including hygiene and food choices) with 50 fun challenges. 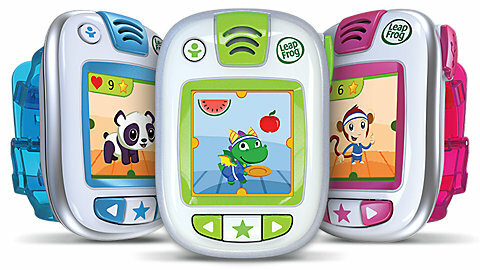 The Leapband tracks activity, can be used as a watch, and it provides an engaging and fun-filled display of motivating, colorful, cartoon virtual pets. Kids simply wear the Leapband, pick a pet, name it, and begin earning points by being active. Points can then be used to play games, and care for your virtual pet. Parents can set up specific challenges and activities for their kids including, “Jump like a frog” and “Walk like a crab” to get kids up off the couch, and moving. Leapband comes with a rechargeable battery, water-resistant design and hi-res screen; it allows parents to manage play times with School and Quiet modes. If you think your kid might enjoy some wearable tech, Leapband will be available in August, and you can choose from green, blue, orange, and pink varieties at leapfrog.com, for right around 40 bucks.